The fireplace has been the focal point of rooms since the 12th century, when the hearth moved from the center of the room to the wall. This simple change created the opportunity to enhance the fireplace with lavish and ornate chimney surrounds and mantels. Of course, this sort of extravagant display was the purview of wealthy castle dwellers who had deep enough pockets to commission intricately carved surrounds were created using wood and stone. This paved the way for the 18th century ‘styling’ of mantels –it was customary to hang a framed family portrait above the fireplace mantel. And while we certainly won’t stop you from using the mantel to display your favorite family portrait, our designers have a few other styling tricks up their sleeves to ensure that you make the most of that fireplace mantel. If you’re going dramatic, go all the way. Make sure that your focal piece is at least 2/3 the size of the mantel. Anything smaller will fill lost. Pay attention to the visual movement created by the objects on the fireplace. If everything is the same height, it will feel staid. Instead you want the eye to move around the fireplace naturally. You could place a branch or plant on the mantel, the organic shape will encourage that visual movement. In addition to visual movement, you want to create visual weight by layering the objects in front of each other. 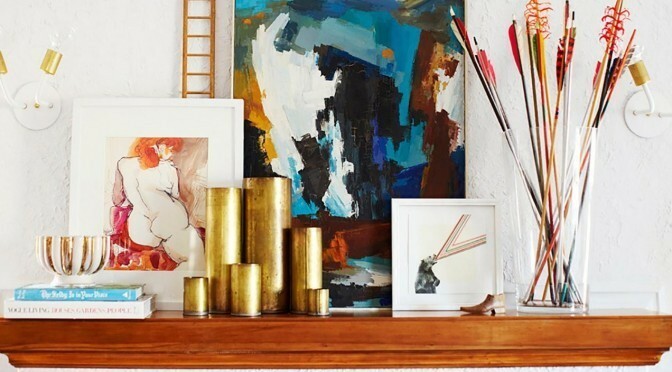 Small objects, candles, even small painting can be propped in front of your larger piece to create a cohesive composition. Along with layering, you want to be sure to add accessories of varying heights. Again, this is about eye moment, you can think of creating a short of wave effect. A single piece of artwork can make a big statement — just make sure it’s large enough. It should be at least 2/3 the size of the mantel. Via House & Garden U.K.